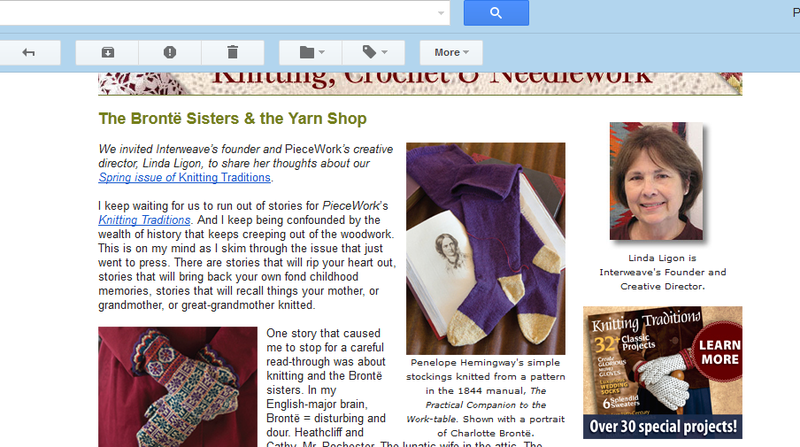 I was really excited last week to get my usual ‘Traditions Today’ email from Interweave, because it was trailing my article and “Mrs Jackson of York“‘s stocking pattern in the forthcoming ‘Knitting Traditions, Spring, 2013’. Available for pre-order now, and should be out at the start of April. I hope those of you who love this nerdy stuff, enjoy reading it half as much as I enjoyed researching and writing. In June, 1845, Anne and Emily Bronte went on “our first long Journey by ourselves “; a three-day long excursion to York. They probably stayed at the George Inn, on Coney Street. We know Charlotte and Anne stayed there as a staging post on Anne’s final journey, in 1849 – and the Brontes were creatures of habit. The George Inn was right opposite Elizabeth Jackson’s Berlin Rooms. York’s other big coaching inn, The Black Swan, was also on Coney St, a few doors down. I went on the trail of knitters in the Brontes’ novels, was privileged to examine some knitting artefacts at the Bronte Parsonage Museum in Haworth; and have recreated the stocking from Elizabeth Jackson’s “The Practical Companion to the Work-Table”, which was in its second edition just as Emily and Anne were staying on Coney Street. From the knitting sticks and the gauge of the needles extant in the Parsonage’s Bonnell Collection, it is clear the Bronte sisters could knit a stocking! …Ostensibly… went to get some shades of Berlin wool, at a tolerably respectable shop that was chiefly supported by the ladies of the vicinity…. 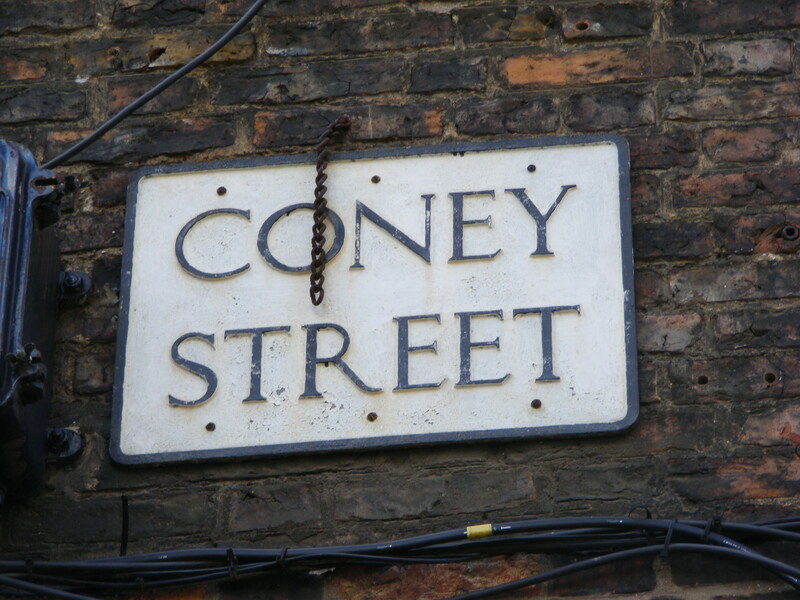 I wonder if Anne did the same, in 1845, on Coney Street? We will never know. But it’s fun, speculating. Just a few textile related items from Selby inventories, from the second half of the 17thC. In amongst this, there are some interesting items. A ‘worsett’ (worsted) wheel would possibly, at these dates, be a sort of intermediate style wheel, somewhere between a great wheel and a smaller wheel. The spinner sat down – instead of walked as at the Great Wheel – and sometimes there was a handle to turn the wheel itself. There may or may not have been a flyer – chances were, the spinner would still have to manually stop to wind the yarn onto the spindle, as on a Great Wheel. The Great Wheel remained pre-eminent for spinning woollen from carded wool; but it seems the new, smaller wheels were seen as better for worsted. As in flax spinning, worsted fibre supply was held on a distaff. In the wood-cut above, the fibre on the distaff is not the characteristic fairytale book conical shape, we associate with flax, so this woman is probably spinning worsted. A ‘spoile wheel’ was possibly a wheel for winding yarn (spoile = spool). 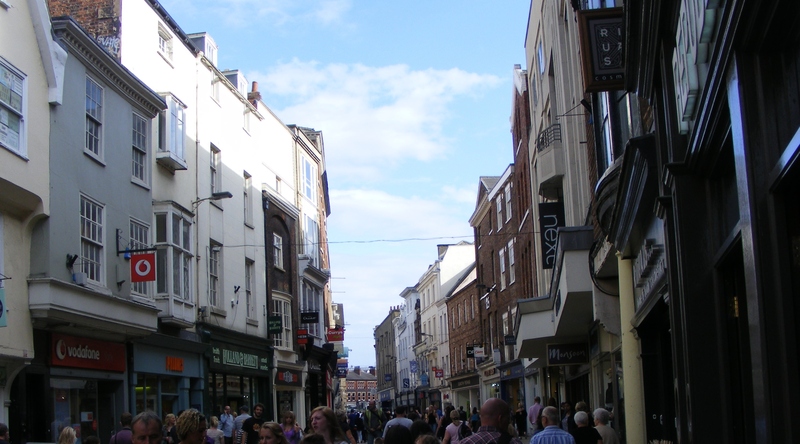 Selby is close to the East/West Riding border, so the dialect word for worsted, “wassit”, now appropriated by some is, slightly further South, rendered as “worsett”. In th e worke shope, 5 loomes, .1 warpin mill, 4 worsett wheeles, 4 spoile wheeles £7-1s-6d. In the Combing Roome, 3 pairs combs,1 pair carsay combs £1-4s-3d. In a Closett, some dyeing waires, £1-0s-3d… In the wool chamber, a parcel of yarn £2-10s, i parcell of comb woole £3-8s-6d, 1 parcell of fleece woole, 3£-3s-9d, i parcell of brooken woole £2-6s , i ps of baggin £1-10s…. Carsay = kersey. It’s interesting that they had a different sort of comb. In “17thC Woolen Cloth Specification”, Stuart Peachey, (Stuart Press, 1991), Devonshire Kersies are defined as “…between twelve and thirteen such said Yards… and being well scoured, thicked, milled, and fully dried, shall weigh thirteen Pounds the cloth at the least….” Yorkshire kersey was notoriously coarser than kersey from more Southerly locations. Kersey was made from combed wool and was woven fairly narrow. It was hard-wearing and comparatively cheap. This one has several points of interest. Robert Watson’s occupation was not noted, but the inventory from his shop was fascinating. NB: stocking knitting needles by the lb. The 2s probably refers to “per dozen”. Note also the use of the word “needles”. The “incle” is a narrow-ware; a warp-faced braid. There are few references to inkle looms, but the fact the braid was called “incle” is suggestive of the idea that maybe there were ‘inkle’ looms by the 17thC. 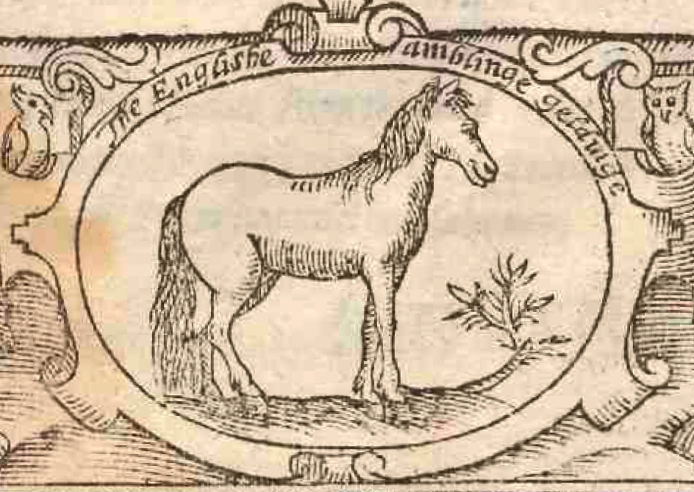 The Shorter OED notes the first usage in 1532. The “blew linnen” may be important. There is some debate as to whether all undershirts were white/undyed, as previously believed, in the 17thC. 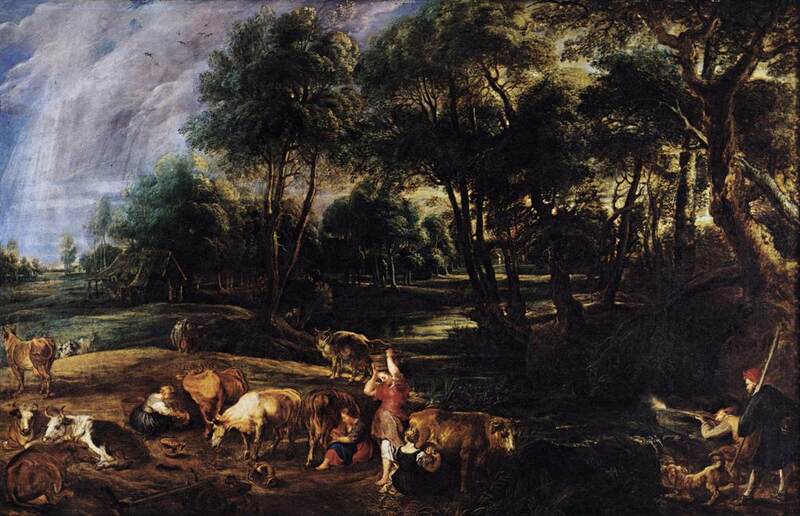 It is possible that blue shirts were also found in the 17thC. This is slightly backed up by Charles I’s blue, silk knitted shirt, from the 1640s. All sorts other things… (three barrels of herring), oil, a huge inventory of spices, and tobacco…. The Retreat. By Gemälde von Carve [Public domain], via Wikimedia Commons. 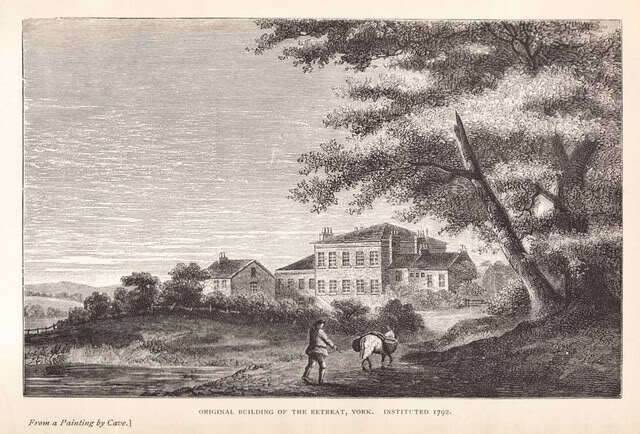 This week I’ve mostly been writing articles, including one about a Dent-dale knitter who was confined to The Retreat, a progressive asylum in York, opened in the 1790s. I stumbled on this terrible knitter of Dent accidentally, when researching the textiles and clothing, spinning and knitting going on at The Retreat in the late 18thC/early 19thC. The ‘Terrible Knitter of Dent’ article will be in a forthcoming issue of ‘Knit Edge’. So I will keep my powder dry and say no more about it here. It’s a gripping story and a rarity to be able to put a name, a description and an entire life story to that usually anonymous body of people; knitters. I hope folk will enjoy reading it as much as I enjoyed researching and writing it. Sometimes, doctors left this blank or said words to the effect “Search me!” A common reason for admission was “Religious melancholy” or simply “Religion”. At the start, most patients were Quakers but as time went on, they admitted on much wider criteria. “1st, an accident, which caused a severe contusion of the Brain. “Uncertain; he thinks he has not been as humble as he ought to have been”. “A tedious confinement with an affected family”. “Perhaps anxiety”! (A 29 yr old woman had three kids the youngest 17 Days). “Suppressed or irregular menstruation”. (A 33 year old woman).